As an event planner, it was extra special for me to plan my wedding. I make it my career to plan memorable events and weddings for my clients and now it was my turn. If you can imagine, I had a zillion ideas of what to do for our wedding; destination wedding in Colorado on top of a mountain, destination wedding in a tropical location over looking the ocean, a New Year’s Eve bash, the options were endless for me as I knew all the possibilities. The ideas were endless, more than the average bride as I have seen and done it all. It was quite the task for my fiance (now husband) to make me pin down just one location and wedding concept. After experiencing a few bumps along the planning process, we opted to host an intimate affair at the Omni Woodway Hotel for a 100 of our closest friends and immediate family. While a destination wedding in Colorado was our favorite option, we knew that not everyone would be able to go. We felt it was more important to share the day with those who meant the most to us vs. the location we were in. For me, I spent little time choosing vendors as I had the inside scoop. This cut my planning time greatly in half. Now on to the fun part, planning and designing the look of the event. This is truly one of my most favorite parts of planning. This is where you can see a couple’s true personality shine through. We choose a classic vintage theme with touches of modern details with a black and white color scheme to fit the evening affair. When choosing the details and colors, I advise every couple to imagine their wedding pictures 20 years from their wedding date. Do they want the classic, timeless look or will their choices make their wedding/event look dated by trends and fads? Like most Groom’s my my hubby didn’t quite share my excitement in the paper thickness for the invitations, or how the napkins would be folded or what type of guest book we would have. He was happy knowing that we would serve good food, have an open bar with a quality selection for our guest and have fun. I do want to share that while the planning process was easier for me than possibly the average bride due to my experience and insight, I too had a few hiccups and bumps in the planning process. It wasn’t anything I could have avoided or anticipated. I won’t lie to say it wasn’t frustrating or upsetting. I did experience stress caused by the hiccups. But, I knew it wasn’t caused because the vendors involved were bad, unprofessional or lacked ability, it was simply a misfortune random occurrence. The difference for me is how I handled it. 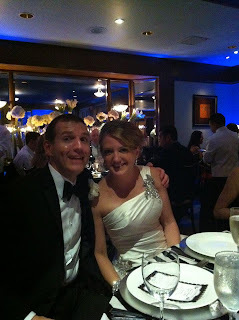 I kept a mindful perspective that the importance of the day was for us to be married and celebrate with our friends. One of the continuous questions I was asked by most vendors was; “Who would be my Day-Of Planner to manage the wedding day?”. Imagine, me an event planner, hiring an event planner?! This question baffled me greatly. How could anyone do it better than I? This was a great misconception of mine. While I enjoyed my wedding day, it was truly very hard to shut off the “planner” in me and enjoy the day as “bride”. Looking back, I know I should have had one of my Associate Planners or professional colleagues oversee my wedding as the Day-Of Coordinator. I caught myself numerous times asking to know the time to know if we were on schedule or going through the mental checklist of what needed to be done still or over-seeing the set-up when I could have spent the time relaxing and socializing with friends and family. My make-up artist (Pink Palette) snapped a picture of me in my wedding dress while they were putting finishing touches on my hair and I’m scanning over the timeline just before going down stairs to shoot the “first look” pictures. This is the complete opposite of how I should have been enjoying the last few moments before starting the whirlwind of festivities. 1. Stop and smell the roses as you’re planning. It’s a once in a lifetime experience that you will want to remember with happy memories. Going into your wedding day with this mental state of mind will increase your enjoyment that much more. 2. Know that if you have a few bumps through the planning process that it’s not going to make or break your day. The most important thing is that you’re marrying the man of your dreams and have a lifetime of memorable moments to later share with your grandchildren. 3. Hire a Day-of Planner!!! This is one of the most important investments you will make. It is equally important to the photographer you choose. Without a Day-of Planner, your wedding day has too many moving parts for you to leave them to chance that they will go just right. The last thing you will want to do is think about it on your wedding day. It will absolutely detract from your enjoyment. As a planner myself, I know first hand.